BERKELEY, CA: As a result of a collaboration between the Haas Institute and several other research and advocacy organizations, the largest low-income housing program in the state will utilize opportunity maps starting in 2018 as part of the siting criteria for new housing projects for families with children. On Wednesday, December 13, the California Tax Credit Allocation Committee (TCAC), which administers housing funds via the Low Income Housing Tax Credit (LIHTC) program, voted to adopt the opportunity maps into the 2018 regulations to promote low-income families’ access to high-amenity neighborhoods, and to reverse patterns of developing new housing predominantly in segregated neighborhoods with high rates of poverty. This development follows months of work by the California Fair Housing Taskforce, which was convened in February 2017 by TCAC and the California Department of Housing and Community Development (HCD). These agencies brought taskforce members together to identify an appropriate data-driven tool for measuring and mapping opportunity within the state. The group was formed partially in response to research by the Haas Institute for a Fair and Inclusive Society showing that LIHTC projects for families in the Bay Area were overwhelmingly sited in low-opportunity areas. The two agencies requested the maps to support regulation changes for 9 percent LIHTC projects that would encourage the construction of family housing developments in neighborhoods with important amenities associated with childhood development and economic mobility, such as high-performing schools and proximity to jobs. 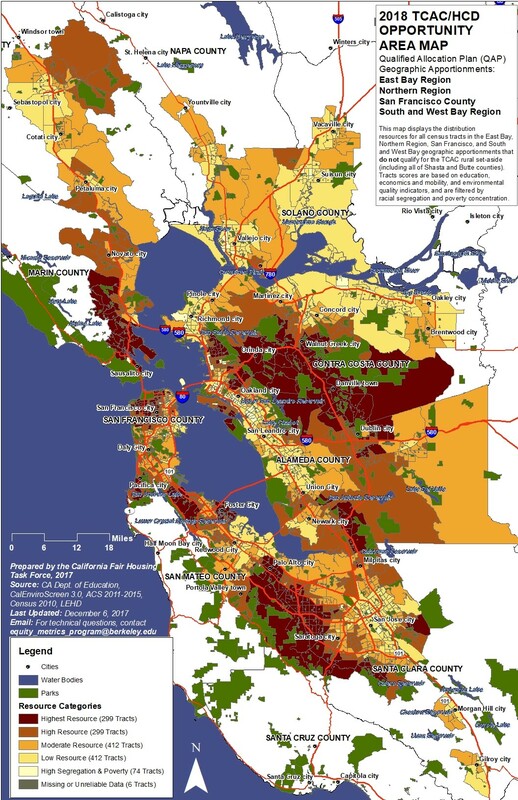 The Haas Institute, along with the Terner Center at UC Berkeley, Enterprise Community Partners, the California Housing Partnership Corporation, and several other organizations, jointly developed a research-based methodology for mapping opportunity to help direct the siting of LIHTC developments that are intended for families. Using the Haas Institute’s Opportunity Mapping framework, and incorporating the most up-to-date research on upward mobility and intergenerational opportunity, the taskforce’s 10-month project culminated in producing maps for all census tracts in California. The taskforce process also incorporated considerations raised by stakeholders across the state during the public comment period. The Haas Institute intends to continue serving as an anchor member of the California Fair Housing Task Force in 2018 and will collaboratively work to update data and to develop solutions to ongoing questions about how the new policy interacts with processes of gentrification, and whether the dynamics of opportunity in rural communities warrant a different methodological approach to measure and promote access to opportunity. The final maps and accompanying methodology documents and summary tables have been released on the State Treasurer’s website.